Many people are now aware of the environmental and humanitarian disaster that is occurring in south-east Asian rainforests as a result of the world’s seemingly insatiable demand for palm oil. They have heard about the massive deforestation, the displacement and imprisonment of local people attempting to protect their land, the use of child labour to work on palm plantations, and the devastating impact on orangutans, Sumatran tigers, elephants, and other endangered wildlife. Because of this, consumers are increasingly avoiding packaged foods containing palm oil, and also ‘vegetable oil’, as this is most likely to be palm. Palm oil is the vegetable oil of choice in packaged food because it is both cheap and, being a highly saturated fat, resistant to rancidity, which provides longer shelf-life. Currently, Australia’s food labelling laws do not require manufacturers to specify the type of vegetable oil they use. In practical terms, the only way to try to find out if a product is palm oil-free is to consult one of the websites that lists palm oil free products, or ask for a written answer from the company involved. Even then, some companies provide disingenuous answers to consumer concerns or do not respond at all. What you can be sure of is that every food aisle in your supermarket will be stacked with products containing palm oil or its derivatives. What surprises many people is that this is also the case for the supermarket aisles containing toiletries and cleaning products. In these, palm oil is most often used as the vegetable-based building block for the synthetic ingredients that are required for the manufacture of soaps, detergents and most skin care products. Once an ingredient has been altered synthetically, it is identified by its chemical name, and its source no longer needs to be stated. We have previously described how palm oil is used to produce the key ingredients of shampoo and conditioner and made our conclusion that there is probably no palm oil-free shampoo or conditioner in Australia. Read it here. The only palm oil-free alternatives to shampoo are palm oil-free soaps, or non-soap methods of washing hair (see our summary below). So what about skin care? Why do most moisturisers and cleansers contain palm oil derivatives? Any moisturiser that contains water, or has a water base such as aloe vera juice or hydrosol, requires an emulsifier to mix the water with the oil. Without an emulsifier, the product would ‘separate’ into its water and oil components. Until recently, the only two palm oil-free emulsifiers available in Australia were lecithin, which is derived from soy, and beeswax. A new emulsifier called glyceryl stearate citrate has just become available on the Australian market, with claims of being palm oil free , but to our knowledge no Australian manufacturer has yet incorporated it into their products. Of course, if a moisturiser is water-free, like Mokosh 100% certified organic moisturisers, there is no need for an emulsifier. Some emulsifiers commonly used in organic skin care include cetearyl olivate, sorbitan olivate, sorbitan stearate, cetearyl glucoside, ceteareth-20, cetearyl alcohol, glyceryl stearate andglyceryl oleate. Currently, palm oil is used in the manufacture of each of these. Until recently, manufacturers that used cetearyl olivate and sorbitan olivate as emulsifiers believed these ingredients were derived solely from olives. 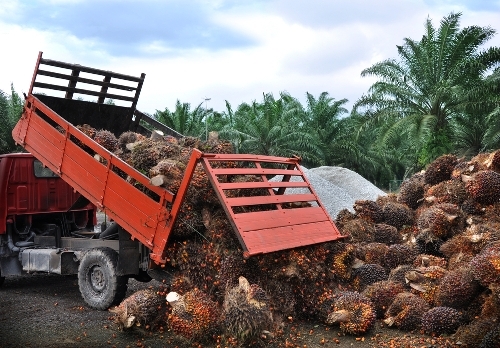 In fact, palm oil is also used to manufacture these ingredients, and they are not palm oil-free. As one might expect, the addition of water to oil means the end-product is going to be very thin, especially when one considers that moisturisers contain up to 85% water. Thickeners are almost always added to moisturisers to improve the viscosity and ‘feel’ of the product. Thickeners that are commonly used in skin care include guar andxanthan gums,carageenan,glycerine, glyceryl caprylate, cetearyl glucoside, sucrose stearate, stearic acid and cetearyl alcohol. Of these, only carageenan, guar and xanthan gums are not derived from palm oil, although it is now possible to obtain palm oil–free glycerine. Most cleansers are based on surfactants, which are compounds that have a detergent action, and are the same synthetic ingredients that are used in shampoos. Examples we found in organic skin brand cleansers include cocobetaine, sucrose cocoate, sodium cocoyl glutamate, sodium cocoyl glycinate and coco glucoside. We reviewed all these products in our blog on shampoo and conditioners. Read it here. All are palm oil-derived, despite the claims by manufacturers of some of these ingredients that they are from coconut. See our discussion on this misrepresentation in the same blog. Mokosh has avoided using palm oil-based surfactants and other synthetic ingredients by producing a non-detergent cleanser based on oatmeal, neem powder, lemon peel powder and other organic plant ingredients. Miessence is the only other brand we could find that produces a palm oil-free cleanser – it contains yucca extract, which is a natural source of saponins, or naturally-occuring detergents. To our knowledge, there are very few Australian skin care brands that don’t contain palm oil-derived ingredients. Unfortunately, if you look at palm oil-free shopping guides, many palm oil-containing brands are still listed as palm oil-free. This may be because compilers of palm oil-free guides tend to rely on statements from manufacturers, many of which do not dig deeply enough to determine where their ingredients come from. As we discovered when researching ingredients in shampoo and conditioners (read it here), it is in fact difficult to determine the true plant origin of synthetic ingredients – many are advertised by ingredient manufacturers as ‘from coconut’, whereas they are in fact derived from both coconut and palm oils. Skin care manufacturers need to be more pro-active in understanding where their ingredients come from, especially if they wish to make palm oil-free claims. Compilers of palm oil-free lists need to be more discerning about the products they include so they do not inadvertently mislead consumers. Finally, the consumer needs to read and understand ingredients on labels, ask questions of manufacturers, and thereby become empowered to make informed choices about where their spending dollar goes.